Peanut Butter is my guilty pleasure. I can no longer have jars of peanut butter in my house because I will eat it by the spoonful! 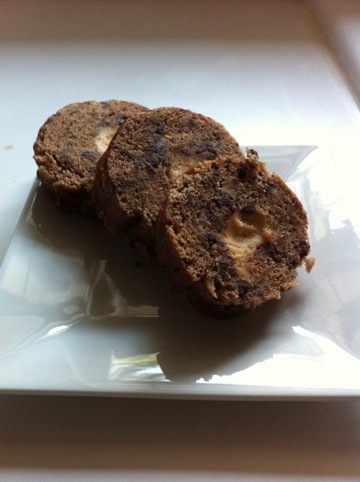 Danny brought this home from work the other night…Chocolate Chip Banana Bread with a Creamy Peanut Butter filling. YUM! Because someone from his job made this- I had to send him on a mission to get the recipe. It is the perfect snack for late afternoon or even a nice dessert choice for after dinner. Or breakfast. Or anytime! What do you like to pair peanut butter with?